Fleet Week SF Returns for 2019! Yes, the Blue Angels are coming back to San Francisco on these dates. If you recall they skipped a year in ’13 but they have been back ever since. Fleet Week stretches from October 6th to the 14th. Main Air Shows are on Sat October 12th and Sun October 13th 2019. The main stage for the airshow is at Ghirardelli Square in San Francisco on the water. It is many blocks down from Pier 39 / Fisherman’s Wharf. Many people stop around Pier 39 thinking this is the main attraction but it is much further down at the Square in San Francisco Maritime National Historic Park(map). Many people will try to check the show from Treasure Island or even the Berkeley Marina. The truth is those are not better viewing locations. The stunts all cross right at the square in front of you and over your head. The other locations are too far away and very crowded. Too many noobs go to Treasure Island thinking they can get a better view and end up in hours of traffic. Now that you know your main destination is Ghirardelli Square(Not Pier 39 / Fisherman’s Wharf), you have to find a way to get there and fight the mass crowds. This is not an easy feat for the weak because the truth is driving here is nearly impossible and totally insane. Trust me. The best way to get to this location stress-free and happy is to leave your house early and get to BART. 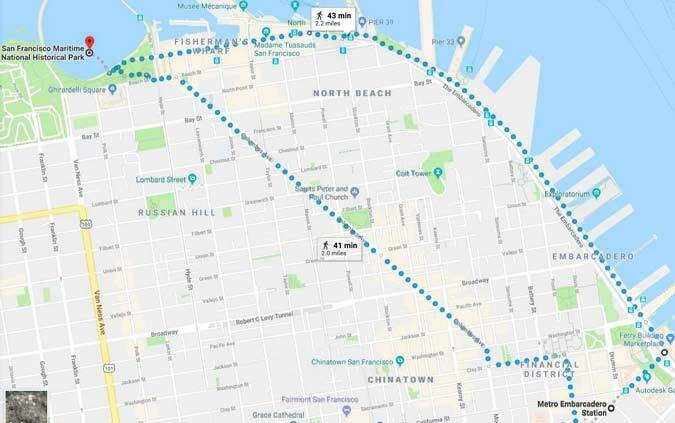 You can then BART to Embarcadero and make the long walk(only 2 miles) from Embarcadero BART down past all the Piers and Fisherman’s Wharf to the Square, the main attraction of the airshow. This is a bit of a walk and it is going to be a very populated path because all of the smart people are doing this. But it is fun, you will see any flying planes, many people of all sorts walking in that direction, and the best part is that you can take your time and drink along the way. As you can see taking the short cut is pretty pointless and will cost you some amazing people watching opportunities. It will also force you to walk up some big hills. It is a great path to walk on the way back but I would not take it on the way to the main airshow. Fleet Week always includes the Blue Angels but many other united states military planes fly about. Typically you will see these planes. 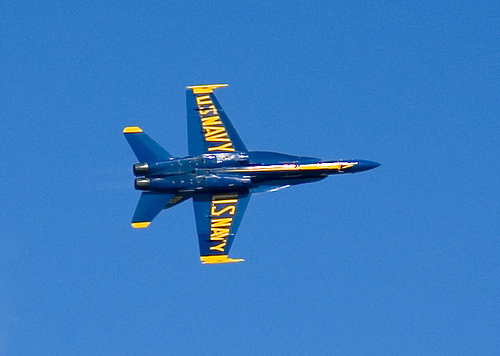 The Blue Angels will be flying United States Navy F-18 Hornets around the Bay that week. Not only on Saturday and Sunday because they do practice fly over San Francisco. Photo by me, see more photos. The Blue Angels Flight Team appearance at Fleet Week 2013 was canceled due to the Blue Angles being grounded the rest of the Air Show Season. This is the first time I have ever seen this happen and I think it is a terrible thing. I grew up going to these with my Dad as a lot of people probably did and we really enjoy this air show. Why don’t we just cancel the war and save money that way instead of cutting budgets here in the US?